TORONTO, ON – Innis & Gunn has announced that a new limited edition summer seasonal is now available in Canada. Made with Hercules, Citra and Simcoe hops – the fruitiest hops around – and a mountain of mangoes, Mangoes On The Run IPA is a refreshing and easy-to-drink beer with a scent of fresh mango flesh, making it the perfect summer sipper. Are your taste buds on vacation yet? 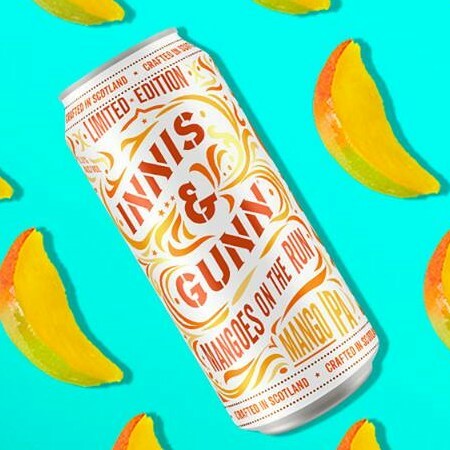 Mangoes On The Run has been rolling out in Canada for the past several weeks, and is now available in 473 ml cans in Alberta, British Columbia, Manitoba, New Brunswick, Newfoundland, Ontario and Saskatchewan. For more details on availability and pricing, check with local retailers.